Bristol City chief executive Colin Sexstone has not ruled out a move for Kilmarnock striker Steven Naismith but says that no firm offer has been made. Sexstone said: "I can quite categorically say we have not made a formal bid for Naismith. "That's not to say there has not been talks between the two managers, that's a different thing." Rangers tabled a bid of £400,000 for the 20-year-old attacker on Monday that was rejected by Kilmarnock. Sexstone said that Bristol manager Gary Johnson is looking to strengthen the newly-promoted Championship side's squad for next season and is targeting a new striker. "I'm sure Steven Naismith and other strikers are on his radar but there has been nothing with regards a formal bid for Naismith," he said. Killie chairman Michael Johnston had earlier refused to reveal the source of the bid from England but told BBC Sport that it would take "a special offer" to consider selling Naismith. When asked if the latest offer was higher than Rangers', Johnston laughed: "That wouldn't be hard, would it?" Johnston said in April that the Rugby Park club would not sell the striker for less than £1m. And he added: "Steven is in no rush to leave Kilmarnock and we are in no hurry to move him on." 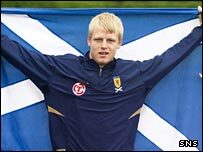 Naismith, whose contract has three years still to run, hit 18 goals for Killie last season and received his first call-up to the Scotland squad for this week's Euro 2008 qualifier in the Faroe Islands. "Until I get a phone call from Kilmarnock, there's nothing I can do," the player told BBC Sport when hearing of Rangers' bid. "The clubs would need to agree a fee first for me to speak to them. "But I'd only want to move to a club that I think is right for me and I'm not going to rush into anything." Kilmarnock manager Jim Jefferies said: "We don't have an exact valuation of Steven. I've said that in the past. "He's been called up to the Scotland squad and is with us for another three years, so he is valuable to us on and off the park. "And if he stays then it will help us consolidate our position in the SPL. "If we don't get a fair price for a player who has his potential then he will stay."